St. Patrick’s Day is right around the corner and residents and visitors of Massachusetts are already gearing up for the big event – South Boston’s St. Patrick’s Day Parade. This year, the parade will also be broadcasted live to the men and women of the armed forces overseas. Included in this year’s parade are politicians, clowns, floats galore, Star Wars characters, and much, much more. The Sunday, March 18 parade is expected to be a 2.5-hour affair, and we’re expecting much of the city to attend. While many of us will be enjoying friends, family, green attire and good times, others will be out there guzzling up all of the green beer they can. You may remember a post from last year’s Boston Personal Injury Attorney Blog discussing the dangers associated with drunk driving and St. Patrick’s Day. Unfortunately, the risks of alcohol-related car accidents are just as likely now as they were then. According to the National Highway Traffic Safety Administration (NHTSA), nearly 40 percent of drivers who were involved in a fatal car crash on St. Patrick’s Day over the last five years were legally drunk behind the wheel, meaning that they had a blood alcohol concentration (BAC) of 0.08 or higher. Our Massachusetts drunk driving car accident attorneys understand that these types of accidents are preventable and it’s a lot easier than you may think. This year, Boston’s got a plan to cut down on drunk driving. Recently the Massachusetts Bay Transportation Authority (MBTA) announced that it would be adding extra bus and subway services to help ensure that everyone makes it to the South Boston St. Patrick’s Day Parade and back home safely. The MBTA will be offering extra Red Line trains to the usual Sunday schedule. These trains will be able to carry the expected increase in riders. 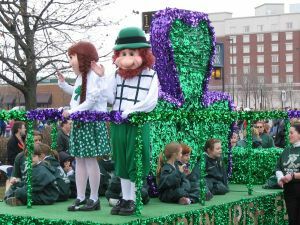 The change in routes and schedules will begin at 11 a.m. on Sunday the 18th and will continue until the parade is over. Bus routes will also be affected in this St. Patrick’s Day schedule. This includes two halted routes for the parade’s duration. Make travel arrangements beforehand to avoid any problems. For more detailed information regarding Boston’s MBTA St. Patrick’s Day schedule, visit MBTA’s website. Please remember, if your plans involve drinking beer this St. Patrick’s Day then make a plan and go out prepared. Whatever you do, make sure that you exclude driving from your plans. Use the MBTA’s services to get a safe ride home. The MBTA is here to help keep residents and visitors safe on the day of Irish celebration. Celebrate safely and responsibly. Happy St. Patrick’s Day! The Law Offices of Jeffrey S. Glassman, LLC is here to support those who have been the victims of drunk driving car accidents in Boston and elsewhere in Massachusetts. If you or a loved one has been injured or killed in an alcohol-related car accident, call 1-877-617-5333 to schedule a free and confidential appointment to discuss your rights.